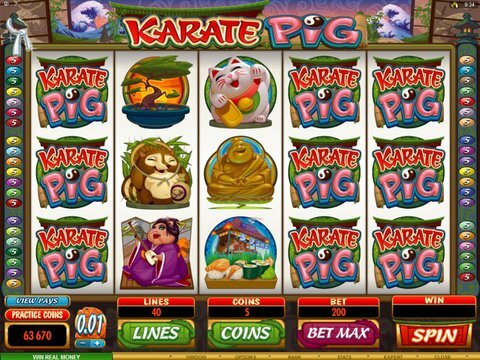 If you're a Canadian fan of free games, then the Karate Pig slot machine is one that you really shouldn't miss. It offers you the chance to enjoy a fun fairy-tale like story about a Pig that takes nothing from anyone. You can review it right here on this page with the no download, no registration Karate Pig free play slot demo that is available. Because it's available on both your computer and your mobile device, you can enjoy it at home or on the go. The betting range with this particular title is quite nice and runs from a penny up to $20. The jackpot here is $5,000, too, so it's a nice little return for even a maximum investment. There are some features here that are quite generous, but the stacked wild is unfortunately not one of them. It can really help out when you see it, but it's infrequent. The other two appear much more often, and these are the free spins you get with Medals on reels one and five at the same time as well as the Bonus Round. There are up to 15 free spins with a 3x multiplier, and there are Pork Chop and Hammer Bonus options which have multiple levels so you can stack up the wins. Another fun title that's based on animals - and is also from Microgaming - is Dolphin Reef. This one takes place on five reels and 20 lines, and it's a glimpse into the underwater world. The jackpot is a quarter million dollars, and you can earn yourself tons of free spins and up to 100x your bet with the treasure chest scatters. There are only five free spins that can be won at once, but they occur frequently and are retriggered fairly easily.